A new resident to Plantation walked out of City Hall with me after attending her first City Council meeting last week. Her first observation was the council members had a spirit of cooperation and encouragement – both when talking to each other and to citizens. That’s what our residents – well, residents everywhere – deserve: A meeting where every single person can toss around their ideas, offer supporting arguments and receive a fair listen even from those who disagree with the majority. And I’m very proud to say that’s how we’re conducting business here in Plantation. I think that conduct sets the tone for the rest of the city. We’re elected to be the leaders, and the attitude our department heads and employees witness then trickles down to them, and then, to their employees. This matters more than you think, because, like it or not, city government is basically customer service. And demeanor matters. Hopefully, we’ll continue to set a good example. “Children will rise to the level of expectation you place on them,” one sage once told me, and I’ve long subscribed to that theory. Apparently, so does Plantation Middle School Principal Dr. Sherri Wilson. So guess which campus she decided to convert her school into? Dr. Wilson and other staffers wore crimson “Harvard” T-shirts with the name emblazed on it, and she invited Mrs. Runcie, a Harvard graduate and wife of the school superintendent, to address the children. Plantation Middle teachers played the role of Resident Assistants. 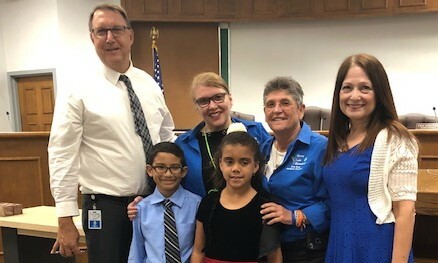 Council member Denise Horland started the idea of having school children from our city lead City Council meetings in the Pledge of Allegiance, and Wednesday night I supported her idea. Liliana Gandia and Abdiel Medina, second graders from Mirror Lake Elementary, stepped right up to the microphone and did a fine job. See photo above, with the children, speech-language pathologist Nancy Ribbler, assistant principal Joan Rose, principal Marlen Veliz and me. The city’s Parks and Recreation Advisory Board meets at 6:30 p.m. Tuesday at the Plantation Community Center, 5555 Palm Tree Road. Like other boards, this one is an unpaid group that lends its expertise on a particular topic. And, like other boards, the meeting is open to anyone. This month’s offering from the Plantation Historical Museum is Ivy Stranahan: The First Lady of Fort Lauderdale. The presentation, by Jon Axler, is at noon Thursday at the Museum, 511 N. Fig Tree Lane. Check Plantation.org/Museum. Get in a good workout and help children afford city summer camps on Sunday. The third annual 5K for the Kids is set for 7:30 a.m. at Plantation Central Park. I ran it last year, but alas, I’ll be out of town this year. So best of luck to all my friends at the back of the pack. Register at SplitSecondTiming.com.